These jello dessert recipes are perfect for making those colorful desserts you enjoyed as a child. Rich fruity flavors, jiggly jelly, and fluffy whipped cream. We're talking about real comfort food, the kind that's always fun to eat and looks every bit as good as it tastes. Prepare 2 or more of your favorite jello flavors as directed on the packages. Turn into separate bowls and chill. Once the jello is firm, break it up into small bits with a fork, keeping the flavors separated. Arrange jello bits of 2 flavors in sherbet glasses. 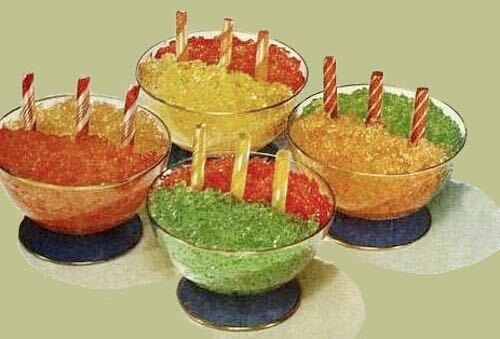 Insert 3 striped candy sticks in each glass for serving. Perfect for a children's party treat. Flavors that go together well are orange and strawberry, raspberry and lemon, or lime and orange. Here is the Triple Layer Jello dessert recipe I have that was my grandmother's. We use it for Christmas, but you could change the color and flavor of the Jello for a different look. Drain and reserve 1/2 cup juice of pineapple. Dissolve Jello in boiling water. Stir in reserved juice. Chill until partly set. Fold in pineapple and chill until set. Dissolve jello in boiling water. Cool and gradually add whipped cream and mayo. Chill until partially thickened. Pour over lime layer. Chill until set. Drain oranges reserving 1/2 cup syrup. Dissolve jello in boiling water. Stir in syrup. Chill until partially set. Fold in oranges. Pour over lemon layer. Chill until set. Garnish with extra oranges and mint if desired. This is a great jello dessert recipe for the Christmas holidays! I really love this Jello dessert recipe. It is delicious! It was given to me by a friend a while back. Enjoy! Pour boiling water into blender. Add gelatin. Cover and blend at low speed until gelatin is completely dissolved; about 30 seconds. Combine cold water and ice cubes to make 1-1/4 cups. Add to gelatin and stir until ice is partially melted. Then add whipped topping. Blend at high speed for 30 seconds. Pour into dessert glasses. Chill about 30 minutes. Dessert layers as it chills. Garnish with additional whipped topping, fresh fruit, and mint leaves if desired. For an added affect, tilt glasses slightly while chilling for angled layers. Make 1 large package of lime jello as directed and allow it to set. Make strawberry jello (I use raspberry jello) as directed on the package and carefully spoon over top of set white layer. 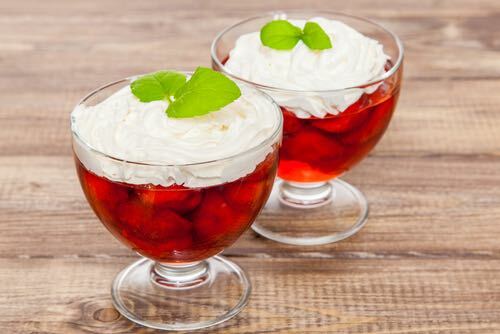 My Mum use to make this delicious flummery dessert when I was a child. She always made it at Christmas for me as I did not like trifle and that was what everyone else ate (along with pavlova of course). I hope this works well for you. 1. Dissolve jelly crystals in boiling water and let cool, but not set. 2. Beat evaporated milk until thick. 3. Add jelly mixture to milk. 4. Continue beating until thick and well combined. 5. Pour into serving dish and chill until firm. I did it. I made mango flummery. I made the jelly according to package instructions. I let it cool a bit before I poured it into the Carnation evaporated milk that I had chilled in the freezer, then whipped with the mixer. I whipped it a bit further and then poured it into a glass dish. Do not add fruits as it will make the flummery runny. Place the fruits in each bowl when serving. —Anon. Use a sharp knife warmed in warm water to avoid tearing the jello while cutting it into cubes. Our family has a recipe similar to what's know as Crown Jewel Dessert. We call it "Broken Glass Torte." Heat 1 cup pineapple juice, add 1 teaspoon gelatin, 1/4 water, and 3 tablespoons sugar. Stir until dissolved. Cool and then add 1 pint of whipped topping. Stir together. Prepare jello colors individually by dissolving each in 1-1/2 cups of hot water. Refrigerate until set. Mix crushed crackers, sugar & butter together and press into 13 X 9-inch pan. Bake at 350°F for 15 minutes. Cool. After jello is set, cut into 1-inch cubes and gently add these to the filling. Spoon into cooled crust. Refrigerate for several hours. 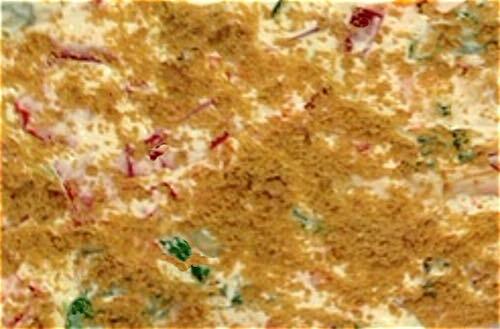 Top with more crushed graham crackers before serving.